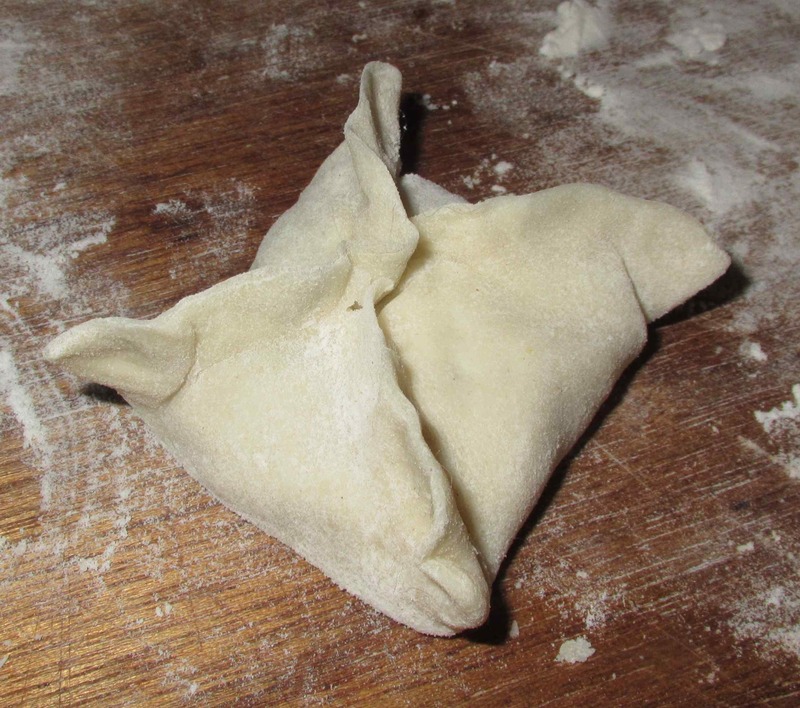 Basic Dumpling Dough made with hot water and 1 cup flour. First, mix together all the filling ingredients (ie: everything except the dough), and then set aside for a half-hour or so to allow the flavors to meld. 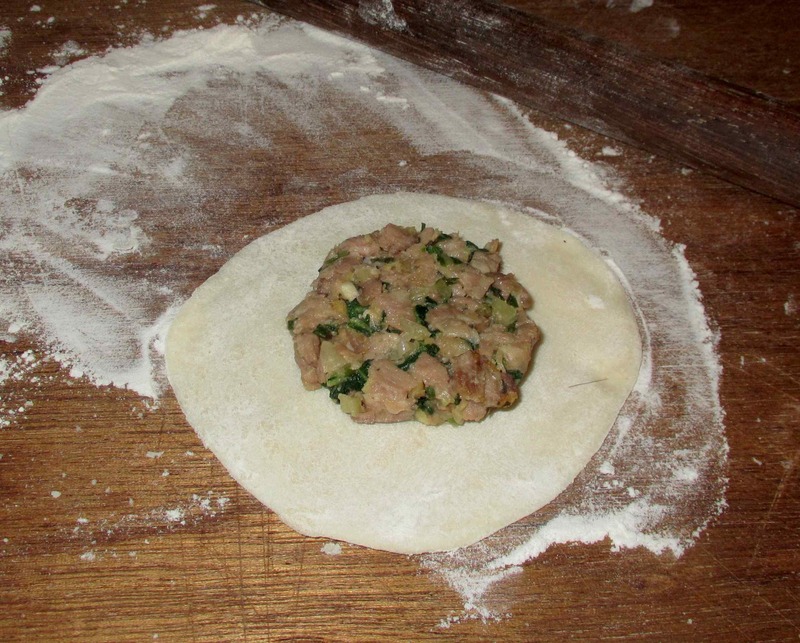 To begin the assembly of a dumpling, take a lump of dough a little larger than a quail’s egg and roll it out to a circle about 3 -4 inches across. 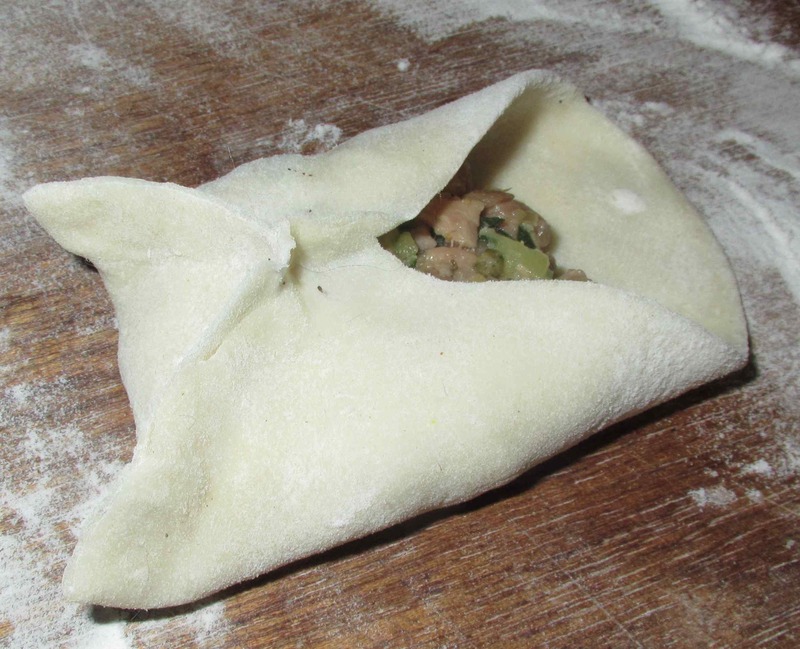 Drop a tablespoon or so of the filling into the middle. To form the wrapper, think of the dough circle as a clock-face and grab the edges at both the twelve and six o’clock marks. 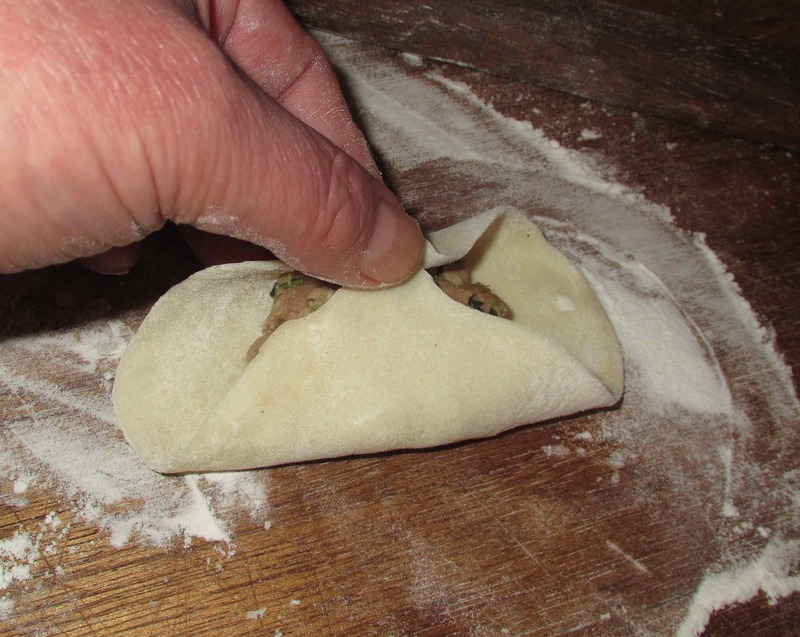 Bring them up over the top of the filling and pinch together at the point they meet. Now, pick up at the nine o’clock mark and bring that point to the sealing point formed in the first step.. You will see that you now have two seams created. Pinch these together firmly. Next, you need to repeat this on the other side. Here, you can see the ‘three o’ clock’ point just before the seal is made. Finally, you have a completed little package. 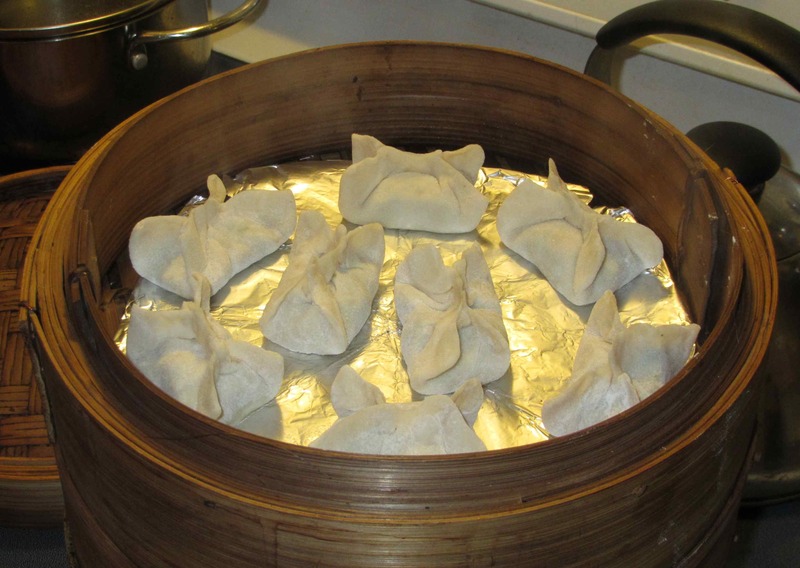 Make sure all the edges are completely sealed and the dumpling has a nice square shape and then repeat with the remaining dough. Your yield should be about 16 dumplings. Steam the dumplings over high-heat for 12 – 15 minutes and then serve with a dipping sauce of your choice. The wife and I enjoyed these with a sauce made from soy sauce, Sichuan chili bean paste and vinegar. My wife enjoyed them very much but, while I though the flavor very good, I wasn’t too keen on the texture. 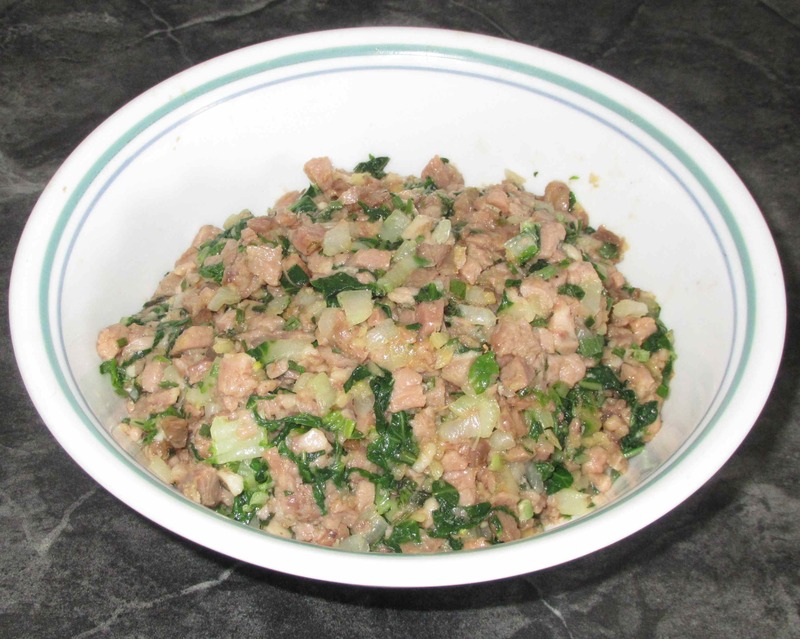 The lamb was a little soft, without much ‘bite’ and a bit more cabbage for crunch would have been an improvement. I think next time, I will add a lot more ginger too! Easy, happy, full-of-flavor recipe 🙂 Loved it. Hugs. 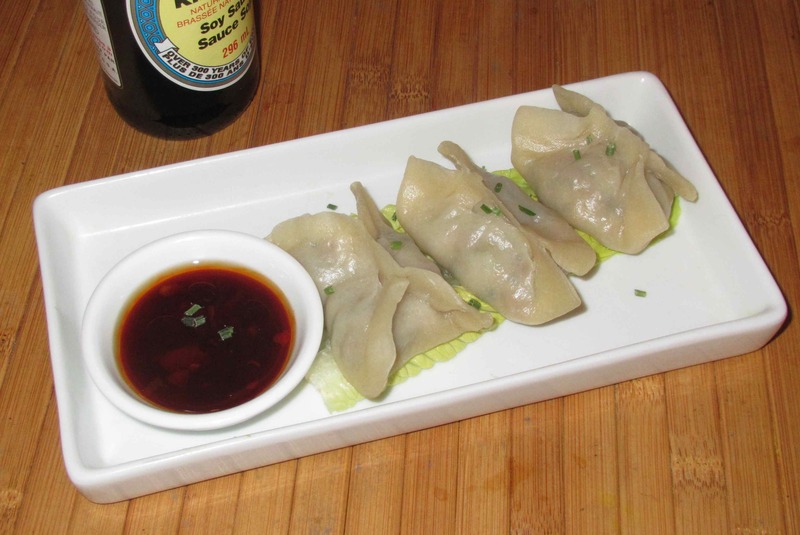 The idea of lamb in a dumpling sounds so wonderful. I wonder if you partially cooked the lamb before steaming if that might help the texture? Anyway, they look terrific! Yes…. I’ve had better results with cooked lamb. Looks terrific, John! 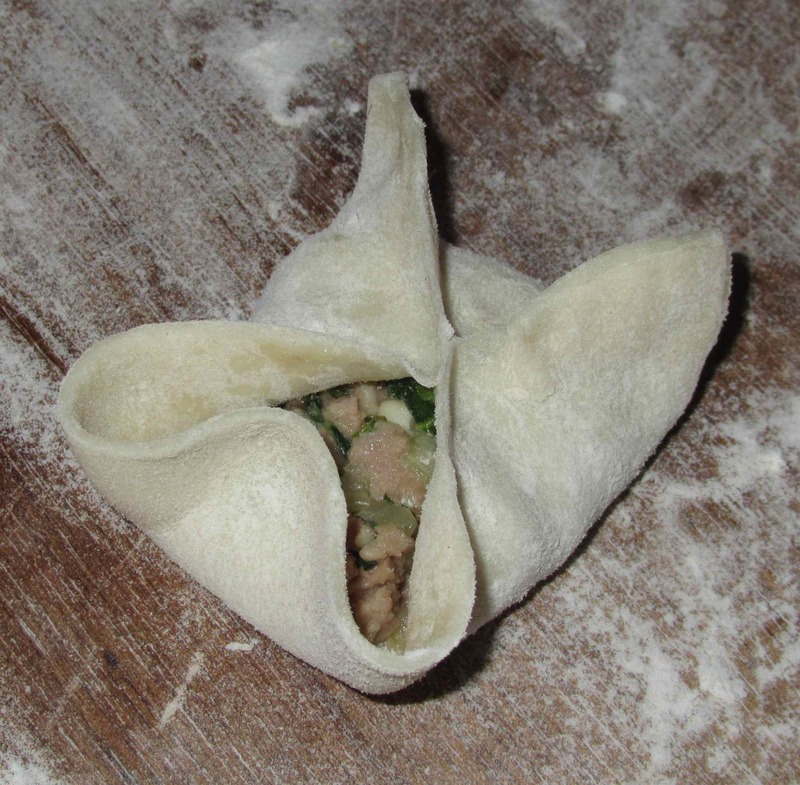 Thanks for a new way to fold dumplings! Not original with me actually… although I can’t remember where I first saw them done this way. Those look amazing, even if the texture wasn’t what you hoped for. The next round ought to be spectacular. TRANSACTION MERCI tr��s satisfaisant VOUS ! what Arnold does, a million sets and 5 hours of steady pumping iron.